Family, Lily. Color, white. Perianth of 4 sepals. Stamens, 4. 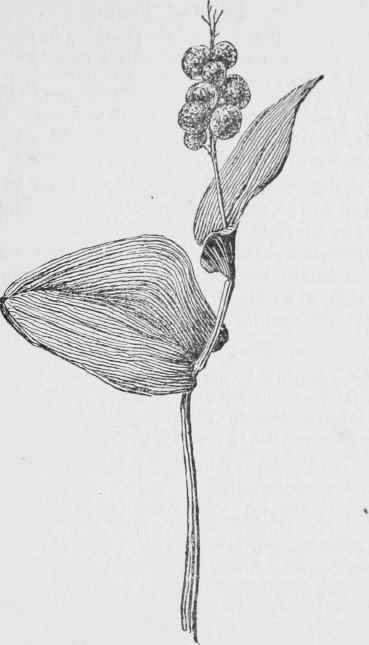 Leaves, 1 to 3, one above the other, on flowering stems, ovate to oblong, pointed at apex, heart-shaped at base, with short, thick petioles, or sessile. Some solitary on longer petioles from the rootstocks. Parallel-veined. Flowers, small, delicate, with a 4-divided perianth, 4 stamens, 1 style, in a terminal spike or cluster, followed in the fall by a bunch of bright-red berries. May and June.